…this time to southern Sonora, Mexico. It’s not quite as exciting as Guatemala, but it’s still a pretty cool destination for birders and other nature lovers. I’m leading a 6-day birding trip that will include the charming colonial town of Alamos in southernmost Sonora plus San Carlos on the coast of the Gulf of California. We’ll start out early tomorrow morning from Bisbee by van, drive through some magnificent Sonoran Desert, and end up tomorrow evening at a hotel by the subtropical banks of the Rio Mayo. 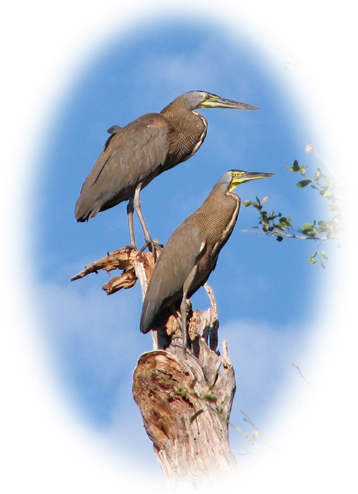 We should see some mighty fine birds, including northbound migrants as well as tropical “specialties” such as Bare-throated Tiger-Heron (above left), White-fronted Parrot, and Social Flycatcher and west-Mexican endemics such as Black-throated Magpie-Jay, Sinaloa Crow, Mexican Parrotlet, and Elegant Quail. Not to mention five species of giant cacti, leafless trees in full bloom over the tropical deciduous forest, and much more. Not as lyrical as Ecobirder’s or Hannibal’s or as socially relevant as Birdfreak’s, but at least it’s alliterative. That satisfies rules 1 through 3, but for various reasons the rest is going to have to be DIY. If you’re a blogger who’s dying to participate but haven’t been tagged, consider yourself “it” (Mark, are you reading this?). When you’ve composed and posted your own memoir, please leave me a comment on this post with a link to your own memoir. And to Sharon I say: Hie thee from this place and meme no more! When I first heard the news about the rediscovery of Beck’s Petrel, the bird’s name sent a little shiver down my spine. The man for whom it was named, Rollo Beck, was an ornithological collector who, on December 1, 1900, may have unwittingly (?) finished off another bird species, the Guadalupe Caracara or Quelili, Polyborus lutosus. and of course the Guadalupe Caracara (Polyborus lutosus). The beginning of the end for the caracara and its ill-fated neighbors was when seafarers dropped off goats in the early 19th century. This was a common practice, intended to provide a reliable source of fresh meat for crews of whaling and sealing ships on extended voyages. The goats proceeded to eat Isla Guadalupe down to rocks and dirt, devouring plants that had evolved for untold millennia in the absence of large herbivores. With the loss of chaparral vegetation that once provided ample condensation surfaces for sea fog, the island became more arid. The loss of habitat for the island’s fauna was compounded in the 1870s by the introduction of cats, which preyed on birds, especially the smaller species, and were major contributors to their extinctions. As if this wasn’t bad enough, the island’s unique and increasingly rare birds attracted the attention of ornithological collectors. In those days, it was common for private citizens to maintain their own collections of natural history specimens, often through trade or purchase, so the market for bird skins and eggs went far beyond museums and universities. Some collectors, such as A.W. Anthony (1901) and Thayer and Bangs (1908) wrote of scouring the island for the last remaining specimens of now-extinct species, presumably operating under the philosophy that shooting them for collections was better than letting them “go to waste” on the increasingly inhospitable island. The significance of these ornithological visitors wasn’t lost on island residents. The same people who persecuted the caracara for its occasional depredations on kid goats soon realized that the species’ increasing rarity could be exploited. Live specimens were brought to San Diego and offered for sale, often for a king’s ransom by the standards of the time. Clinton Abbott’s obituary for the species (1933) reconstructs the heartbreaking stories of these unfortunate birds, including one killed in a Tripp-esque fit of pique when its captor failed to get his asking price. Daniel Cleveland, a charter member of the San Diego Society of Natural History, wrote to Abbot about a fisherman who brought six caracaras to San Diego in 1897. No one was willing to meet his asking price of $150, and the birds all died within a month. Cleveland remarked that “…the man’s greed resulted in our failure to rear some of these birds in captivity….” As much as I disapprove of rewarding such exploitation, had someone been willing to pay these poor birds’ ransom, we might be celebrating the successful reintroduction of the caracara to its island home instead of grieving its extinction. On December 1, 1900, Rollo Beck encountered a flock of 11 caracaras. They were very tame and approachable, as island species with no land-based predators often are. He shot them all, but two managed to escape. By his own account he did not realize until later how rare they were and that he may well have been the last person to see one alive. At the risk of raising the ire of some of my respected museum colleagues, I have serious doubts about this profession of ignorance. According to Abbot’s correspondence with various players in this tragedy, the caracara was acknowledged to be “a rare bird in process of extinction” as early as 1875, a quarter century before Beck’s fateful visit. It’s hard to imagine that such a well-connected character as Beck was so out of the loop that he was completely unaware of the increasing rarity of this species. Wasn’t the promise of rare specimens precisely what lured ornithological collectors to Isla Guadalupe? If you thought that this sad story would change the attitudes of the collectors who followed and the institutions who employed them, you’d be wrong. The birds of Guadalupe Island were hunted by ornithologists at least as late as the 1950s, though hopefully with somewhat more restraint than shown by Beck. This wasn’t the only time Beck helped hasten a critically endangered species toward extinction. In 1906, on an expedition to the Galapagos Islands for the California Academy of Sciences, he collected three male Pinta Giant Tortoises, Geochelone [nigra] abingdonii, out of only four known survivors at the time. Again, Beck was simply one nail in the coffin, the others being relentless exploitation of the tortoises for meat and habitat destruction by introduced goats (a familiar pattern). The species was thought lost until 1971, when a lone male was discovered roaming the Pinta backcountry. Dubbed “Lonesome George” for his dismal romantic prospects, the tortoise was moved to the Charles Darwin Research Station for safekeeping and study. He has so far lived up to his name by failing to produce any hybrid progeny with females from the Wolf Volcano (Isabela Island) species–which, like the rediscovered petrel, bears Beck’s name (Geochelone becki). Guadalupe Island, which was originally declared a nature preserve way back in 1928, is now a biosphere reserve where goats are ungulata non grata. Seacology, a nonprofit organization whose mission is the preservation of endangered island biodiversity throughout the world, contributed to the recovery of what’s left of Guadalupe’s fauna and flora by funding another group, Island Conservation, to erect goat exclosures within which native plants could find refuge. The Mexican government funded a major goat removal program, and with the hooved locusts almost gone the vegetation is beginning to recover. Survey teams have even rediscovered several plant species presumed extinct, but only in a conservationist’s wildest fantasies could we hope for the rediscovery of Isla Guadalupe’s lost caracara, towhee, wren, flicker, or petrel. A research team working in the Galapagos has identified a male giant tortoise on Isabela Island as a first-generation hybrid between the Isabela and Pinta species. Another male doesn’t do Lonesome George much good, but the team is optimistic about finding a female with pure Pinta DNA among the 2000-odd tortoises on Isabela (maybe the hybrid’s mom?). Speaking of DNA, skins of the Quelili and the other extinct birds of Isla Guadalupe can be found in various collections in the Americas and Europe. If DNA could be extracted from them, might it be possible one day to resurrect these lost birds by implanting eggs of their closest relatives with cloned embryos? Anthony, A.W. 1901. The Guadalupe Wren. Condor 3(3):73. Abbott, Clinton G. 1933. Closing History of the Guadalupe Caracara. Condor 37(1):10-14. Howell, Thomas R., and Cade, Tom J. 1954. Birds of Guadalupe Island in 1953. Condor 56:253-294. Hawk killer banned from scene of crime! Golfer Tripp Isenhour has been charged with two misdemeanors after an incident in which a hawk was killed on our property while Isenhour was taping a TV show. No one from the Grand Cypress Resort was present when the incident occurred, and we did not learn about it until after the fact. We cooperated fully with the Florida Fish and Wildlife Conservation Commission when it investigated. Golf is a sport that is rooted in the enjoyment of nature and being outdoors. In fact, one of the special treats our guests currently are enjoying is seeing bald eagles that are nesting on our property. We are distressed and saddened by the hawk incident and want everyone who hears about it to understand the resort’s feelings and that the resort was not involved. This is great! From the timing, the club obviously had this statement in the works even as I was working on my original post. I’m disabling the e-mail link there but reinstate it here for those who would like to express their gratitude to Grand Cypress for its prompt and uncompromising response to the issue. Let’s hope for an equally positive response from Titleist, and that when Mr. Isenhour gets his day in court he gets smacked upside the head, metaphorically speaking, with the full force of the law. In yesterday’s post about the senseless killing of a Red-shouldered Hawk by pro golfer Tripp Isenhour (left), I provided a link to the PGA feedback form where you can express your feelings about this childish, reprehensible act. But does someone who exhibits such poor judgment and lack of ethics deserve the privilege of playing at such a prestigious course as Grand Cypress Golf Club? Not to mention all the bad publicity he’s brought on the club. If you’d like to comment on this to Grand Cypress management, maybe suggest that he be banned for life, you can use either this e-mail link or the Web form. BTW, the deadly projectile was likely a Titleist Pro V1X. That’s Isenhour’s preferred ball according to his PGA profile. He’s also on the Titleist Web site, so I’m guessing that he receives some level of sponsorship from them (free balls at least) in exchange for the use of his name and likeness. Does he deserve free Titleist balls if he’s used them to break federal law and commit animal cruelty? If you’re thinking, “No, he doesn’t,” you can express this opinion to Titleist world headquarters toll free at (800) 225-8500, 9 a.m. – 6 p.m. Eastern Time Monday-Friday. Golf as a blood sport? If a golfer repeatedly thwacked balls in your direction, you’d have reason to believe that he was trying to kill you. After all, a golf ball can travel over 175 miles per hour, and people have been killed by errant balls. But we’re not talking hooks and slices here–this is intentional. Now imagine taking the force of one of those golf balls if you weighed less than two pounds. That’s exactly what happened to a Red-shouldered Hawk that had the fatal misfortune of tee-ing off professional golfer Tripp Isenhour. The hawk, a resident of Grand Cypress Golf Club in Orlando, Florida, had the audacity to start calling (persistently, as Red-shoulders are wont to do) while Isenhour was taping a segment for a TV show, Shoot Like A Pro. The bird was probably protesting the TV crew’s proximity to its nest, as it flew closer to the men even after Isenhour reportedly chased it down and thwacked a few balls toward its original perch. On the second round, he kept at it until one of the balls connected and the bird plummeted to the ground, broken and dying, before the eyes of the horrified crew. To compound their culpability, they then hid the evidence by burying the carcass. Apparently the only reason we’re hearing about it now is that sound engineer Jethro Senger was so troubled by sleepless nights and bad dreams that he finally reported the incident to authorities. You can read the rest of the sordid details here, here, and here. This isn’t the first time a federally protected bird has died at the hands of a pro athlete on the job, though such blatantly deliberate acts are rare. Baseball has taken the biggest recorded toll, including an Osprey, a Mourning Dove, and an unidentified gull all hit by baseballs (the latter two died instantly). If this keeps up, ESPN might have to take its tongue out of its cheek when it revises its list of ten worst examples of animal cruelty in sports (how insulting is it that they included mascots?). Like Wisconsin’s Green-breasted Mango, this case seems minor but has far-reaching implications. Isenhour is a professional sports figure, supposedly a role model, and adherence to the highest standards of conduct should be a small price to pay in exchange for the $2 million he’s won in tournaments over the last four years (not to mention the income from his TV and video deals). Isenhour could be charged with violations of both federal law (the Migratory Bird Treaty Act) and lesser animal cruelty laws. Suggested consequences have run the gamut from the trollish (a reward for making such a stunning shot) to the wickedly appropriate (letting people tee off at him for a donation to the Audubon Society) to the alarmingly extreme (sorry, but the MBTA doesn’t allow for capital punishment). Keeping it within normal legal and ethical limitations, I don’t think it’s too much to ask that his punishment include a hefty fine, community service (preferably cleaning cages at the Audubon Center for Birds of Prey), and a suspension of his PGA membership. A little jail time would be nice, but I won’t hold my breath for that. The actual punishment meted out to Isenhour could depend in large part on the judge. One of the most daunting issues facing the people charged with enforcing wildlife laws is that judges too often don’t take such cases seriously or identify too strongly with the accused. If the case goes before a judge who’s a golfer, Isenhour could walk away with a slap on the wrist. If the judge is a birder–and there are many more birders than golfers, though not necessarily on the bench–we could see a meaningful sentence that will make other ego-addled athletes think twice (if they think at all) before aiming a ball, club, or bat at a protected bird. We bird lovers might not be able to influence the court’s decision, but we might be able to persuade the PGA to hit Isenhour where it hurts most: in his career and bank account. Please leave your comments on this situation on the PGA feedback form. And what about the TV crew that stood by and watched it happen? I hope that all but whistle-blower Senger get charged as accessories and sentenced to community service. I’m sure the Center for Birds of Prey has enough hawk poop to go around.